Waterford FC Under-19s eased to victory in the Under-19 Southern Elite Division at the RSC on Sunday afternoon as four first half goals shocked league leaders Cobh Ramblers. 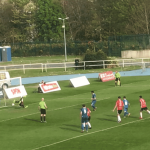 New Waterford FC signing Paul Keegan proved the hero for the Blues as his goal handed the Blues an important three points in a 1-0 win against Longford Town on Saturday in the City Calling Stadium. 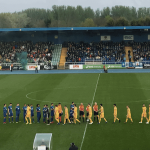 Waterford FC will look to extend their lead at the top of the First Division table this Saturday with a trip to face Longford Town in the City Calling stadium. Waterford FC Under-17s stretched their lead at the top of the Under-17 Southern Elite Division with 4-2 win in a brilliant footballing performance away to Cork City at Bishopstown on Tuesday evening last. Waterford FC U19s returned to league action with a hard earned 1-1 draw away to UCD on Saturday afternoon last. Waterford FC Under-17s remain unbeaten in the Southern Elite Division after a hard-fought 2-1 win at home to Bray Wanderers on Saturday.